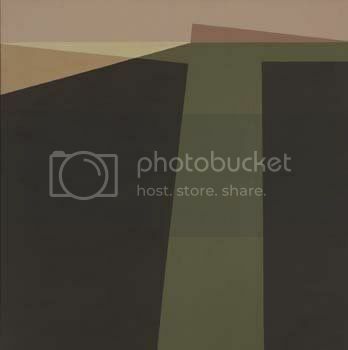 i've quickly become enamored with the work of helen lundeberg, having just viewed 5 or so of her paintings featured in OCMA's 'birth of the cool' exhibit. we overheard a docent mentioning the powers that be were reluctant to include her work as part of the 'hard edge painting' movement back in the 60's. supposedly her compositions were believed to be too architectural. and yes, she was a woman swimming in a largely male dominated pool, which probably explains why i'd never heard of her until almost 10 years after her passing. i'm pleased to see she's so prominently displayed in this exhibit....i spent a long time getting lost in her visionary scapes. I really really really liked her stuff Sweetie, and I'm so glad we went Sunday to the show. girl--you gone 'n' done changed your blog appearance up on me! Hey, looks swell, dumplin. Swell.